Check out our review of the Nokia Lumia 820 Windows 8 phone. 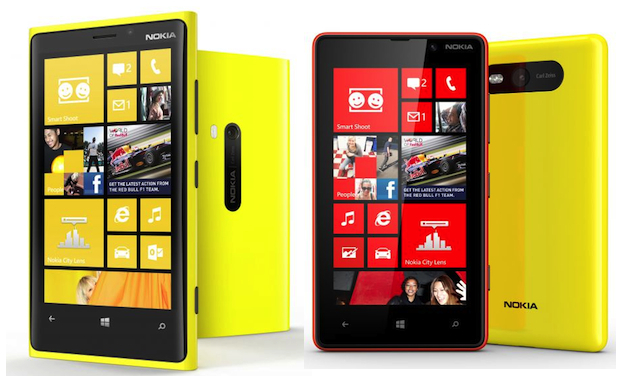 AT&T has announced the pre-order and launch dates for the Nokia Lumia 820 and Lumia 920 Windows Phone 8 handsets. Eager buyers will be able to secure their phones on November 7, then settle back and wait for release on November 9. The prices for these 4G LTE phones are particularly reasonable, and less than those rumored, with the Lumia 820 costing a mere $50, and the higher-specification Lumia 920 just $100; but you’ll have to sign your life away for two-years to take advantage. You can choose between a red, white, grey, black or yellow Lumia 920, while the Lumia 820 comes with a variety of rear covers for you to choose between. You’ll probably be lusting after the Lumia 920 and if you’re planning on grabbing one, don’t wait around too long, as AT&T has a limited amount of wireless charger pads to give away for free with each Lumia 920 sold. In case you need a reminder, the Lumia 920 has an 8.7-megapixel, PureView camera, a 4.5-inch touchscreen with a 1280 x 768 pixel resolution and a 1.5GHz dual-core Snapdragon processor. It’s little brother, the Lumia 820 has a smaller 4.3-inch screen with a 480 x 800 pixel resolution, an 8-megapixel camera and the same 1.5GHz, dual-core Snapdragon S4 processor inside. Both run Microsoft’s new Windows Phone 8 operating system, and come with Nokia’s many special apps, including Nokia Maps, Nokia Drive and Nokia City Lens. It’s only the Lumia 920 that has wireless charging as standard, but it’s possible to buy a new rear cover for the Lumia 820, which then equips it with the handy feature too. The Lumia 820 and Lumia 920 are exclusive to AT&T, but T-Mobile offers its own version of the 820, named the Lumia 810, and Verizon will also be getting in on the Windows Phone 8 fun with the Lumia 822. They’re identical when it comes to features, but vary slightly in design. You can find a roundup of all the other Windows Phone 8 handsets here.